Here’s your guide to watching Spider-Man: Into the Spider-Verse this weekend! 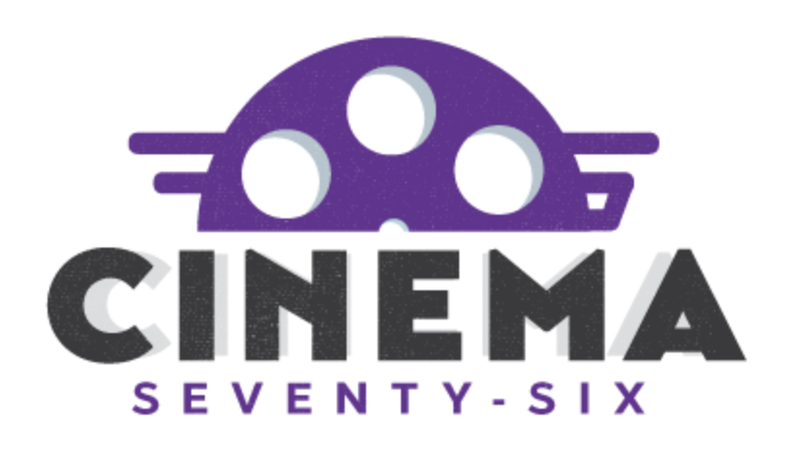 Now you’ll be able to complain with the best of them about how the comics got it better. Join us as we dig into the comic books and previous adaptations of one of all of the Spider-Men (and women)! So another Spider-Man reboot, really? Nope! Tom Holland is safe (from everyone save Thanos). This film is animated, and takes place in an alternate dimension. The main character isn’t Peter Parker, either. Rather, Into the Spider-Verse focuses on Miles Morales, created by writer Brian Michael Bendis and artist Sara Pichelli in 2011. Miles is a 13 year old from Brooklyn, with a black father and a Puerto Rican mother. Like Peter Parker, he’s a smart nerdy kid whose life is changed when he is bit by a very special spider. He has all of Spider-Man’s powers, plus he can do active camouflage and a ‘venom blast’ which is kind of like an electrical shock. That’s all you need to know for the film. Into the Spider-Verse makes a few minor changes to Miles’ origin, but it’s close enough where I’m putting a spoiler warning on it. Here it is. This is the spoiler warning. 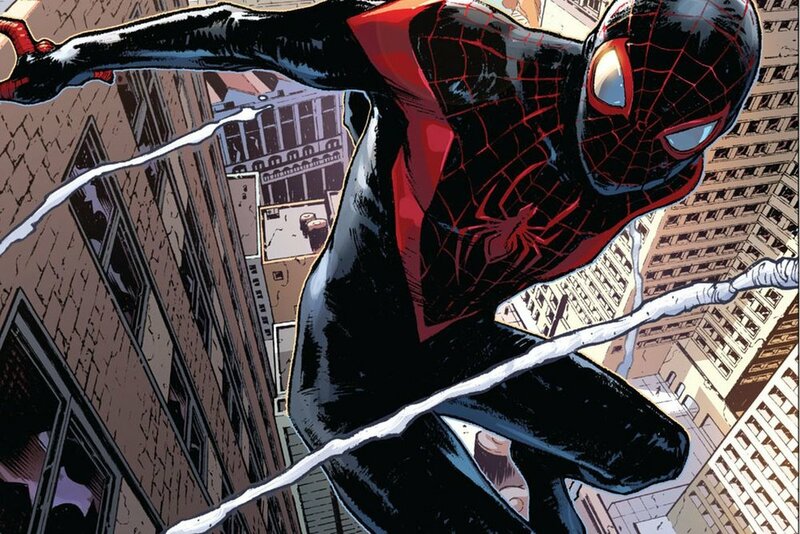 Miles Morales is from the Ultimate Universe, which was an imprint of Marvel Comics started in 2000 as a way to restart and tell stories with fresh interpretations of their existing characters while also not upsetting longtime fans by rebooting any existing story. In this universe, Brian Michael Bendis and artist Mark Bagley introduced a new version of Peter Parker and told his story from the beginning, riffing on classic stories and updating some elements. It’s a consistently good run of comic books, and ran for 160 issues from 2000 to 2011. In the final issue if the series, Peter Parker dies at the hands of Norman Osborn (the Green Goblin). Before his death, Osborn was working on replicating the accident that made Peter Parker Spider-Man by enhancing spiders with Parker’s blood. Miles Morales is bit by one of these spiders when it stows away in his uncle Aaron’s duffel bag during a laboratory robbery. Miles has no idea that Aaron is secretly the villain the Powler (Aaron was played by Donald Glover in last year’s Spider-Man: Homecoming). Eventually, Miles becomes the new Spider-Man, meets the “main” universe Peter Parker (more on that in the Reading Recommendations section), and gets folded into the “main” universe himself after the Secret Wars event in 2015. While there was some pushback initially from the typical sources, the quality of the comics featuring Miles Morales was good enough (and the fact that Peter Parker is still featured heavily in a bunch of other comics) for that to die off. At this point, he seems widely accepted by readers. And a lot of that has to do with the way he was written by Bendis. While I can’t speak to any sort of cultural voice (given that Bendis is white and Morales isn’t), his character is well-defined and fleshed out. Even in comics featuring him that are not written by Bendis, the voice of the character more or less carries over intact. Miles Morales is one of the best characters to be introduced in the last 10 years. Ultimate Comics Spider-Man Vol. 1 is where to start with Miles Morales, and you can read his story pretty much straight through from the last 7 years. I also highly recommend Bendis and Pichelli’s Spider-Men, which is the first meeting between the main Marvel Universe Peter Parker and Miles Morales. It also features Mysterio, who is both awesome and to be played by Jake Gyllenhaal in next year’s Spider-Man movie. And there’s other Spider-people in this too? Yep. There are 4 alternate interpretations of Spider-Man other than Peter and Miles. Here’s the lowdown on each and their comic book versions. The film acknowledges the comics versions while making slight tweaks when needed. Spider-Woman (aka Gwen Stacy, also known as Spider-Gwen and Ghost Spider) - She debuted in the comics in 2014, during the Spider-Verse event from which this film takes its name. Created by Jason Latour and Robbi Rodriguez, she is an alternate universe version of Peter Parker’s girlfriend (Emma Stone played her in the Andrew Garfield movies) who was bit by a spider instead of Peter. Her excellent costume design is already a favorite among cosplayers, and the fun twist on her origins made her resonate with comics readers. She has been appearing consistently since her debut, both in her own series and several crossover stories. One of the reasons I love her character is that they have made her a unique character. She isn’t just like Peter Parker or Gwen Stacy, but they’ve used it to reimagine Spider-Man comics from a unique perspective. For instance, her version of Peter Parker tried to exact revenge on his bullies and became The Lizard, though he died shortly after. Since then, Spider-Woman has been wanted by police, especially Cpt. Frank Castle and Matt Murdock (her world’s Kingpin). Oh, and she’s in a band called The Mary Janes. The Captain America in her universe is a female version of Sam Wilson (The Falcon in the MCU) and Peggy Carter runs SHIELD. It’s a fun universe, and the art by Robbi Rodriguez is not your typical superhero comic art. It’s more impressionistic, kinetic, and pop-tart looking, which also makes it stand out. The whole series is really interesting and fun. The first Spider-Gwen collection also includes her first appearance. Highly recommended. Her series also crossed over with Miles Morales’, and they got smoochy. Spider-Man Noir - Back in 2009, Marvel launched a series of noir-themed miniseries featuring superheroes reinterpreted for a 1930s noir style. Spider-Man Noir was created by David Hine, Fabrice Sapolsky, and Carmine Di Giandomenico and has a striking costume based on World War I aviator gear. There’s two miniseries that star this version of Spider-Man (voiced by Nicholas Cage in the movie), but I find his interactions with other versions of Spider-Man to be much more fun. Check out the original miniseries and his return as part of the Spider-Verse comic event. Spider-Ham (aka Peter Porker) - This is why I love comic books. Introduced by longtime Spider-writer Tom DeFalco and artist Mark Armstrong, he debuted in the 1983 comic Marvel Tails Starring Peter Porker, the Spectacular Spider-Ham. The comic was all funny-animal parodies of Marvel heroes, including Captain AmeriCat, Goose Rider, Squawkeye, and more. In the original comic, Peter was a spider bitten by an irradiated anthropomorphic pig (May Porker was inventing a nuclear hair dryer at the time), but his origin has also been given elsewhere as a normal pig who was bitten by a radioactive spider. I also must note that at one point he shows up in one of the Marvel Zombies series, gets bitten, and become Ham-bal Lecter. 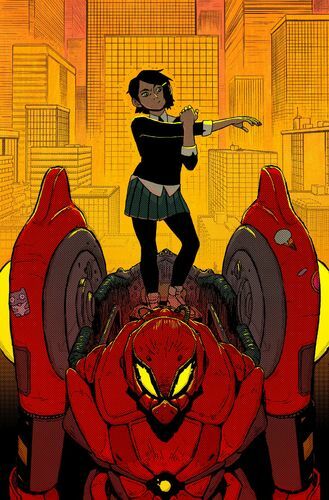 Peni Parker and SP//DER - Also introduced in the 2014 Spider-Verse event, this version of Spider-Man is inspired by anime, especially Neon Genesis Evangelion. A Japanese American, Peni was bitten by a spider that forms half of the SP//DER robot suit her father designed, giving her a psychic link to work with the robot. She was created by writer Gerard Way (yes, of My Chemical Romance) and artist Jake Wyatt. Her debut is one of the only comic that focuses on her to date, but she also has a solo issue in this year’s ongoing Spider-Geddon story. In 2014, the mega-crossover Spider-Verse spans 30+ issues of comics and concerns an army of Spider-People fighting the Inheritors, a group of interdimensional vampires who dress like they are from the 1800s and wish to feed on people with spider powers. The story itself is fine, despite building off one of the the worst eras for Spider-Man comics (early 2000s), but the collections are laid out in a confusing way, with the main story up front and all the tie in issues in the back, so you need to flip around a ton to read everything in chronological order. It’s a super frustrating experience, so I am not recommending it. Secret Wars: Spider-Verse (featuring Spider-Gwen, Noir, Ham, and others) was part of another Marvel line wide crossover, and this also works as if these Spider-people/pig have never met before. That miniseries was popular enough to get a follow up as Web Warriors, telling stories of a group of Spider-People facing problems across the multiverse.